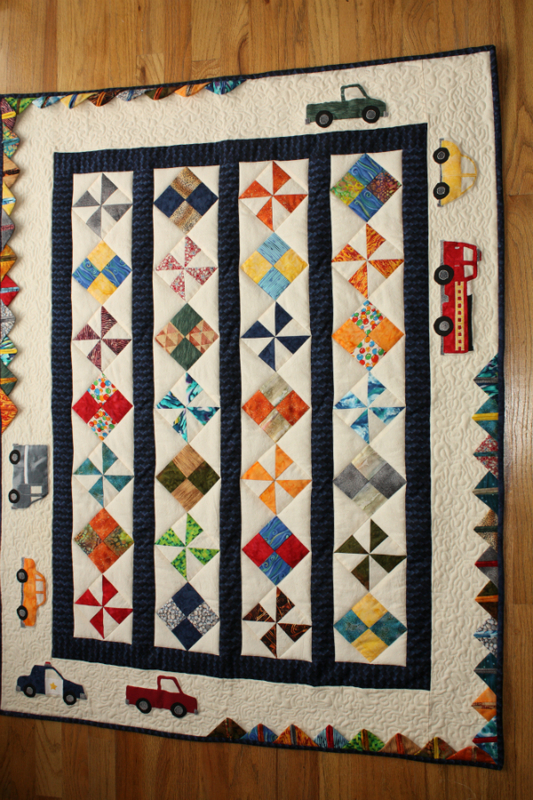 What lovely quilts you shared with us....I really love the Dolphin Quilt with the "watery" fabric....and the real truck is such a treasure! So fun to see your progression as a quilter. Love your flower box cushion and noodles quilt. Yay!! I'm so glad you decided to do a trunk show of your own! 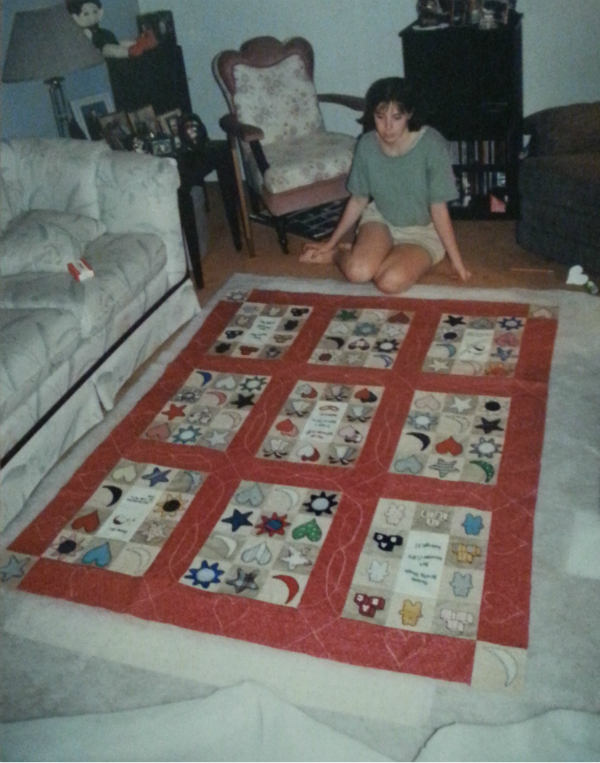 :) So fun to see how your quilting has changed over the years. 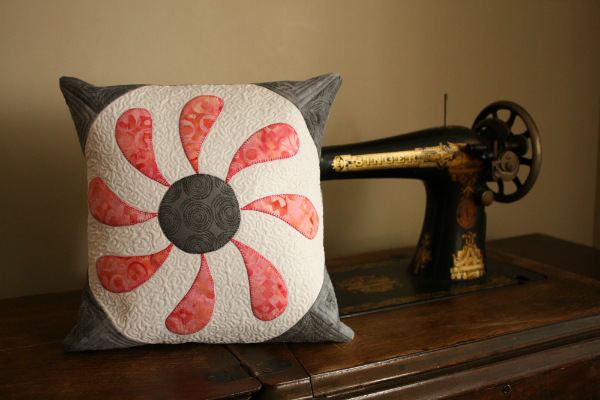 The swap quilt is gorgeous and I just love how that flower just pops right off of that pillow! Well now, you win the prize for the best trunk--I mean really, you keep your stash in one. That's so cool! It's been so fun seeing your quilts. I am a fan of Margaret's Wolfe's Ark animals, so you may have heard a squeal when I came to those. 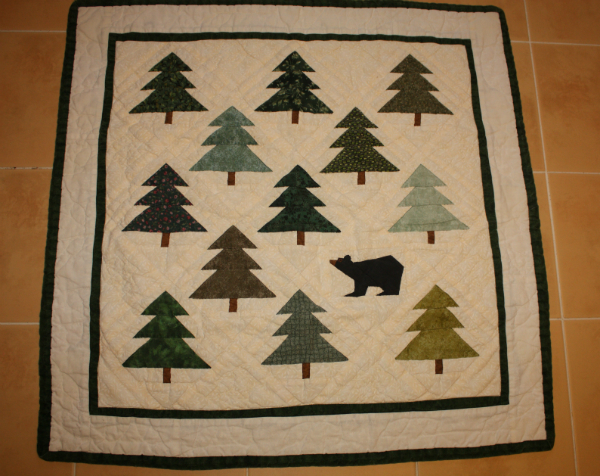 (I made a zoo quilt for a nephew from her book.) 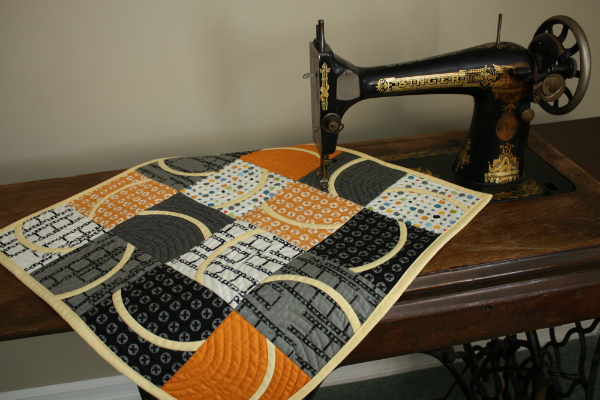 Have you ever used your treadle machine for sewing or quilting? It's a beauty. I love how you paired it with a modern quilt in your photo. Love your stash trunk! The quilts for the boys are all fun. Love that you have a quilt called Noodles, it's a beauty. Wonderful show! Your quilts are so beautiful and your quilting on them is amazing. Add great photos and you've really made this trunk show a fun visit. I love your trunk! I have one that I should have photographed for this trunk show...wish I'd thought of it. Thank you for sharing! Leanne I enjoyed all your pics. Your wall hangings are fabulous. Love the quilts you made for your boys too. My fave is your scrappy log cabin. I think your car quilt is a version of Karie Patch's Jack and Jill. I've made the sailboat version. Love the way you changed that border! Beautiful scrappy log cabin. 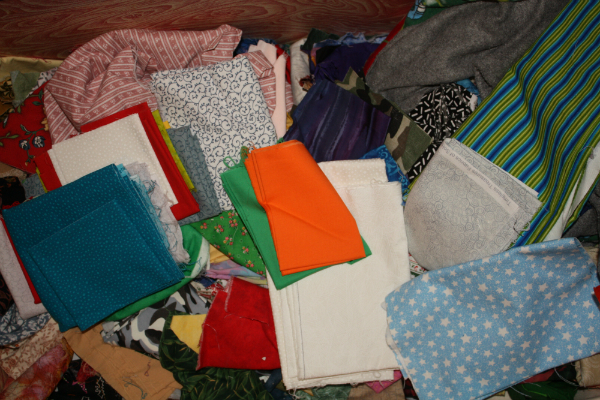 Thanks for sharing all of your quilts. 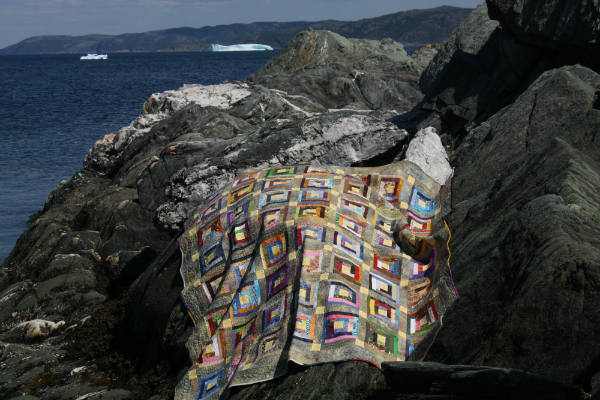 Your quilts and your quilting are so beautiful, Leanne!! I can't pick a favourite. Thanks so much for sharing. What a wonderfull job you've done on all you quilts. 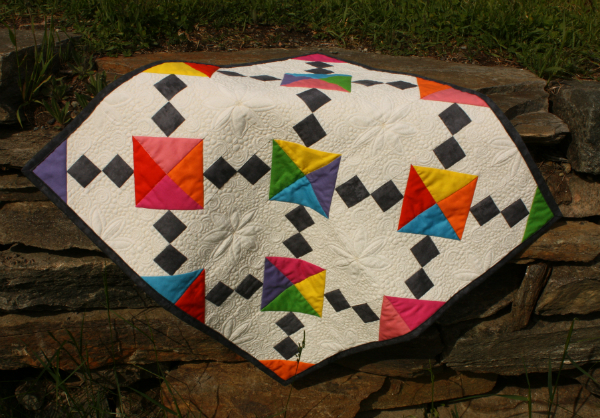 Thanks for sharing your quilting history with us as well as your lovely quilts. I so enjoyed your trunk show and am jealous you even have an old trunk!!! I *love* that your stash is stored in a trunk, that is so fun and perfect for this show. It is so much fun to get to see a retrospective of your work and progression of your style. It is also fun to see your photography and artistic quilt displays evolve, too. Love your quilts, and your sons' names too, the same as 3 of my grandsons! And yours is a true "trunk show." I love your trunk and the show. It has been fun seeing your quilting for the last year and a half. Your old trunk does make my heart skip a beat. How fortunate are you to have such a treasure! Love all your quilts. Your son Nathan's quilt is a delight; those cars are such fun. 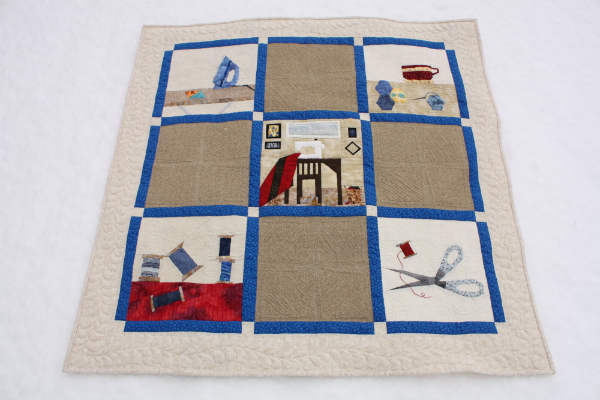 Your scrappy log cabin is a scrappy treasure and your Schniztel and Boo Mini Quilt is singing a happy tune. Your FMQ is very impressive! Great trunk show. I love the addition of the cars to your son's quilt and your curvy noodles is brilliant. 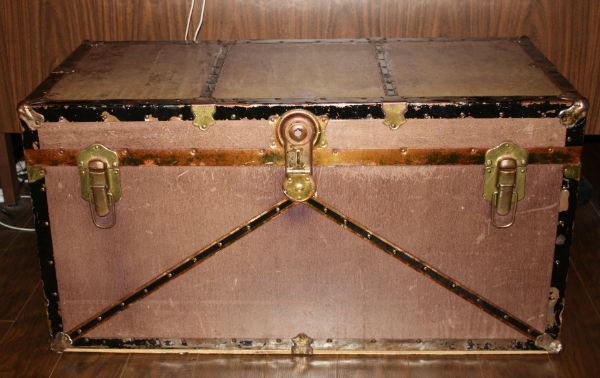 This is a great trunk show, and that old trunk is fabulous! 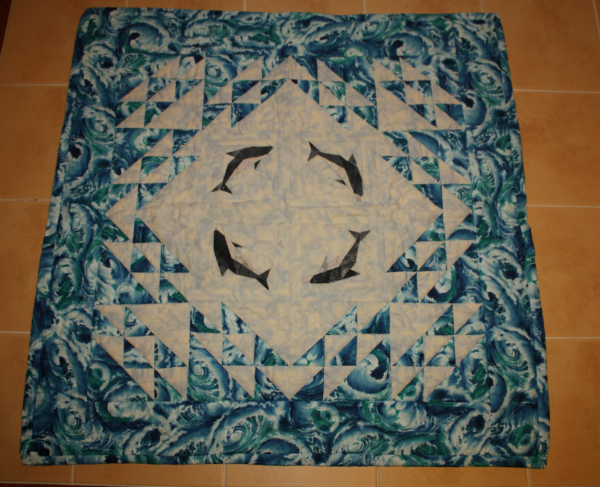 The dolphin quilt is really cool, with the blue fabric that looks like water. Just so creative Leanne! Thank you for a great trunk show. I really like seeing the quilts everyone has made. My favorite is the bear in the woods one. Very nice. I also like all the vehicles you put in your son's quilt. I made a trip around the world quilt, and was planning on appliqueing vehicles around the sides. This helps picture what that might look like. Your work is beautiful. Congratulations on your published pattern. It is lovely and I really like the ones you are working on now. Lovely work - it was fun seeing how your quilts evolved over time!